Abnormalities of 11q23 involving the MLL gene are found in approximately 10% of human leukemias. To date, nearly 100 different chromosome bands have been described in rearrangements involving 11q23 and 64 fusion genes have been cloned and characterized at the molecular level. In this work we present the identification of a novel MLL fusion partner in a pediatric patient with de novo biphenotypic acute leukemia. Cytogenetics, fluorescence in situ hybridization (FISH), molecular studies (RT-PCR and LDI-PCR), and bioinformatic sequence analysis were used to characterize the CT45A2 gene as novel MLL fusion partner in pediatric acute leukemia. Fluorescence in situ hybridization of bone marrow G-banded metaphases demonstrated a cryptic insertion of 11q23 in Xq26.3 involving the MLL gene. Breakpoint fusion analysis revealed that a DNA fragment of 653 kb from 11q23, containing MLL exons 1-9 in addition to 16 other 11q23 genes, was inserted into the upstream region of the CT45A2 gene located at Xq26.3. In addition, a deletion at Xq26.3 encompassing the 3' region of the DDX26B gene (exons 9-16) and the entire CT45A1 gene was identified. RNA analysis revealed the presence of a novel MLL-CT45A2 fusion transcript in which the first 9 exons of the MLL gene were fused in-frame to exon 2 of the CT45A2 gene, resulting in a spliced MLL fusion transcript with an intact open reading frame. The resulting chimeric transcript predicts a fusion protein where the N-terminus of MLL is fused to the entire open reading frame of CT45A2. Finally, we demonstrate that all breakpoint regions are rich in long repetitive motifs, namely LINE/L1 and SINE/Alu sequences, but all breakpoints were exclusively identified outside these repetitive DNA sequences. We have identified CT45A2 as a novel spliced MLL fusion partner in a pediatric patient with de novo biphenotypic acute leukemia, as a result of a cryptic insertion of 11q23 in Xq26.3. Since CT45A2 is the first Cancer/Testis antigen family gene found fused with MLL in acute leukemia, future studies addressing its biologic relevance for leukemogenesis are warranted. Abnormalities of 11q23 involving the MLL gene are found in approximately 10% of human leukemias . MLL rearrangements are present in >70% of infant leukemias, irrespective of the immunophenotype being more consistent with acute lymphoblastic leukemia (ALL) or acute myeloid leukemia (AML), but are less frequent in leukemias from older children . MLL translocations are also found in approximately 10% of adult AML, and can also be found in a proportion of patients with therapy-related leukemia after treatment for other malignancies with topoisomerase II inhibitors . Although clinically and morphologically heterogeneous, MLL-rearranged ALL and AML show unique gene expression profiles [4, 5]. To date, nearly 100 different chromosome bands have been described in rearrangements involving 11q23 and 64 fusion genes have been cloned and characterized at the molecular level . The most common MLL fusion partners are AFF1/AF4 (4q21), MLLT3/AF9 (9p23), MLLT1/ENL (19p13.3), MLLT10/AF10 (10p12), MLLT4/AF6 (6q27), ELL (19p13.1), EPS15/AF1P (1p32), MLLT6/AF17 (17q21), and SEPT6 (Xq24) . Usually, MLL rearrangements result from the non-homologous-end-joining (NHEJ) DNA repair pathway following DNA damage . Reciprocal chromosomal translocations are the most frequent events associated with the genetic recombination of MLL, but other mechanisms have been identified, including internal partial tandem duplication (MLL-PTD), chromosome 11 deletions or inversions, and several types of complex MLL rearrangements . Occasionally, chromosomal translocation or deletion have been described to originate MLL spliced fusions, which arise by fusing the 5' MLL region to downstream located partner genes . In the present study, we have identified the CT45A2 gene as a novel fusion partner of MLL in a pediatric patient with de novo biphenotypic acute leukemia (BAL), as a result of a cryptic insertion of 11q23 material in Xq26 resulting in a spliced MLL fusion. A 6-year-old boy was admitted to the Portuguese Oncology Institute (Porto, Portugal) with a history of fever, asthenia and cutaneous pallor. Peripheral blood analysis revealed anemia (Hb 6.3 g/dl) and bicytopenia. Bone marrow analysis revealed the presence of 51% of blasts with the immunophenotype CD3+, CD13+, CD33+, and CD117+, which lead to the diagnosis of biphenotypic phenotype (T/myeloid) acute leukemia. No blasts were detected in the cerebrospinal fluid. He was treated according to the ELAM 02 protocol (aracytine, mitoxantrone and methotrexate) and entered complete remission after induction chemotherapy. Seven months later he was submitted to allogeneic bone marrow transplantation with umbilical cord hematopoietic progenitors, but the patient showed evidence of relapse after one year. Treatment with the AML relapse protocol was started, but only partial remission had been achieved four months later. The patient underwent a haploidentical transplant with his mother's peripheral blood cell progenitors, but the disease relapsed again and the patient died nine months later. The diagnostic bone marrow sample was cultured for 24 hours in RPMI 1640 medium with GlutaMAX-I (Invitrogen, London, UK) supplemented with 20% fetal bovine serum (Invitrogen, London, UK). Chromosome preparations were made by standard methods and banded by trypsin-Leishman. Karyotypes were described according to the International System for Human Cytogenetic Nomenclature . Fluorescence in situ hybridization (FISH) analysis was performed using the LSI MLL Dual-Color, Break-Apart Probe and LSI IGH/BCL2 Dual-Color, Dual Fusion Probe (Vysis, Downers Grove, USA), respectively, in previously stained metaphases that have been destained and processed for FISH as described . High molecular weight DNA and RNA were extracted from the bone marrow sample using 1 ml of Tripure isolation reagent (Roche Diagnostics, Indianapolis, USA), according to the manufacturer's instructions. The DNA sample was treated and analyzed as previously described [11, 12]. Briefly, 1 μg of genomic DNA was digested with restriction enzymes and self-ligated to form DNA circles. Amplification was performed with specific primers for fusion sequences on der(11) and der(X). LDI-PCR reactions were performed as described  and according to the manufacturer's recommendations (PCR Extender System, 5 Prime, Hamburg, Germany). Amplified products were analyzed on a 1% agarose gel (SeaKem LE Agarose, Rockland, USA). PCR amplimers were isolated from the gel and subjected to DNA sequence analyses to obtain the patient-specific fusion sequences. After sequencing, unknown sequences were characterized by blasting the human genome database (Genomic BLAST, http://blast.ncbi.nlm.nih.gov/Blast.cgi). For cDNA synthesis, 1 μg of RNA was subjected to reverse transcription with random hexamers using the Superscript III First-Strand Synthesis System for RT-PCR (Invitrogen, Carlsbad, USA), according to the manufacturer's instructions. RT-PCR assay for detection of MLL-CT45A2 fusion transcripts was performed with a forward primer (MLL-S; 5'-GAGGATCCTGCCCCAAAGAAAAG-3') located in MLL exon 8 (GenBank accession no. NM_005933) and a reverse primer (CT45A2-AS; 5'- GGCCATCCTCTGCCTTTTC-3') located in CT45A2 exon 2 (GenBank accession no. NM_152582). Additional primers in the MLL breakpoint cluster region (exons 9 to 13) and CT45A2 open reading frame (exons 3 to 5) were used to exclude the presence of additional splice variants (data not shown). PCR reactions were performed in a 50 μl reaction volume containing 2 μl of synthesized cDNA, 5 μl of 10× GeneAmp PCR buffer II (100 mM Tris-HCl pH 8.3, 500 mM KCl) (Applied Biosystems, Foster City, USA), 5 μl of 25 mM MgCl2, 0.4 μl dNTP mix (25 mM each dNTP) (Applied Biosystems), 0.4 mM of each primer (Metabion, Martinsried, Germany), and 1 unit of AmpliTaq Gold DNA Polymerase (Applied Biosystems). Reaction tubes were kept on ice at all times to prevent non-specific amplification and incubated for 5 min at 94°C, followed by 35 cycles of 30 sec. at 95°C, 1 min at 63°C, and 1.5 min at 72°C, followed by a final elongation of 10 min at 72°C on a GeneAmp PCR System 9700 (Applied Biosystems). Amplified products were analyzed on a 2% agarose gel (SeaKem LE Agarose) and the results were visualized in an image analyzer ImageMaster VDS (Amersham Biosciences, Little Chalfont, UK). Search for DNA sequence motifs known to be associated with site-specific recombination, mutation, cleavage, and gene rearrangement, and repetitive sequence elements spanning or in the vicinity of deletion and insertion breakpoints [13, 14] was performed with SEQ tools  and RepeatMasker . Search for repetitive sequence homology was performed with ClustalW . 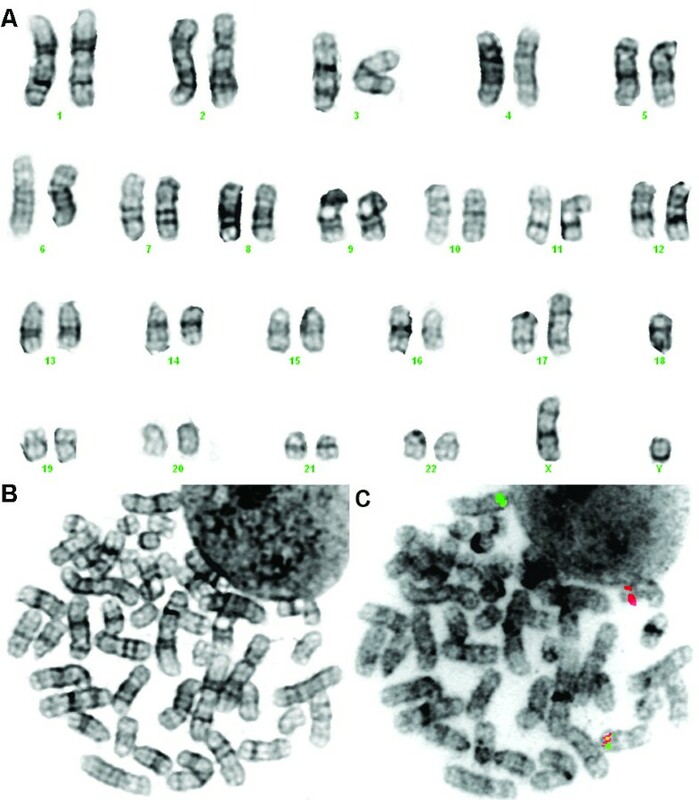 The bone marrow cytogenetic analysis revealed abnormalities of chromosomes 14 and 17 and monosomy of chromosome 18 (Figure 1A-B). FISH analysis on previously G-banded metaphases showed a cryptic insertion of the 5' MLL gene region in Xq22~25 (Figure 1C), which suggested a rearrangement of the MLL gene, and also the presence of a BCL2 gene copy on the der(17). Based on the chromosome banding and FISH findings, the karyotype was described as 45,XY,add(14)(q24),add(17)(p13),-18.ish ins(X;11)(q22~25;q23q23)(MLL5'+;MLL5'-,MLL3'+), add(14)(IGH-),der(17)(17qter→17p13::?::18q21→18q21::?)(BCL2+)/46,XY. Cytogenetic analysis of the bone marrow sample of the AML patient. (A) Karyogram showing abnormalities of chromosomes 14 and 17 and monosomy of chromosome 18. The same metaphase after G-banding (B) and after destaining and processed for dual-color FISH analysis (C) showing a cryptic insertion of the 5' MLL gene region (green) in Xq22~25. Using LDI-PCR as described above, the patient's sample was screened for germline and non-germline PCR amplimers that were subjected to sequence analysis. The results implicated that a large fragment of 653,099 bp from chromosome 11q23 was inserted into Xq26.3 (Figure 2). 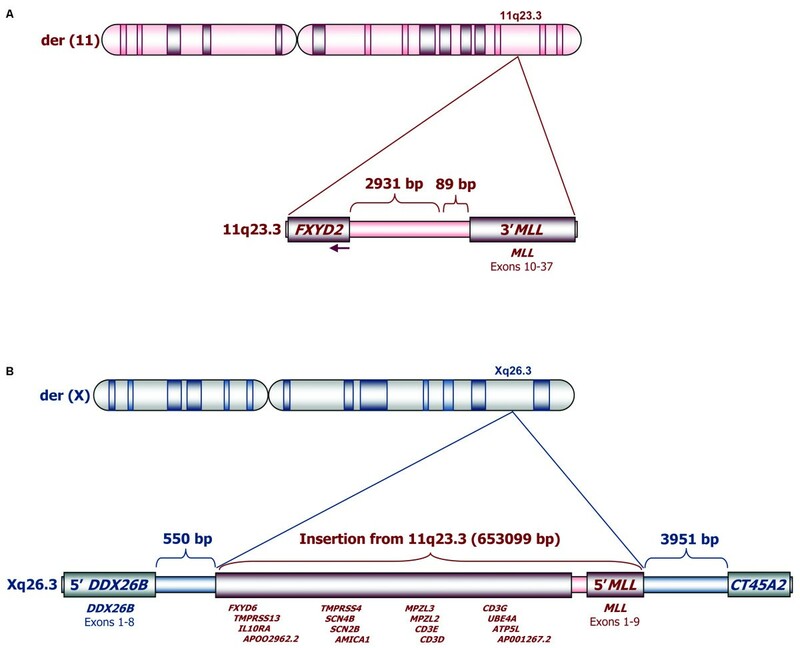 We determined that the 5' and 3' breaks in 11q23 occurred 2,931 bp downstream of the FXYD2 gene and 89 bp upstream of MLL exon 10, respectively, with 19 bp being deleted from MLL intron 9 (TGTTTTTTAGATCTATTAA) and with the insertion of two nucleotides at the breakpoint junction (GG; see Figure 2A). The insertion of 11q23 material into Xq26.3 contained the 5' MLL region (exons 1 to 9) in addition to 16 other 11q23 genes (FXYD6, TMPRSS13, IL10RA, APOO2962.2, TMPRSS4, SCN4B, SCN2B, AMICA1, MPZL3, MPZL2, CD3E, CD3D, CD3G, UBE4A, ATP5L, and AP001267.2; see Figure 2B). Regarding Xq26.3, we found that the insertion had occurred in DDX26B intron 8, 550 bp downstream of DDX26B exon 8 and 3,951 bp upstream of the CT45A2 gene, with the insertion of two (CG) and three additional nucleotides (GAA) at the breakpoint junctions, respectively (Figure 2B). In addition to the insertion, a large fragment of Xq26.3, encompassing the 3' region of DDX26B (exons 9-16) and the CT45A1 gene, was deleted. Schematic representation of the cryptic insertion of 11q23 sequences in Xq26.3. The 11q23 breaks occurred 2,931 bp downstream of the FXYD2 gene and 89 bp upstream of MLL exon 10, respectively (A). A large fragment of 653,099 bp from chromosome 11q23 was inserted in Xq26.3 (B), leading to the transfer to Xq26.3 not only of the 5' MLL region (exons 1 to 9) but also of 16 other genes (FXYD6, TMPRSS13, IL10RA, APOO2962.2, TMPRSS4, SCN4B, SCN2B, AMICA1, MPZL3, MPZL2, CD3E, CD3D, CD3G, UBE4A, ATP5L, and AP001267.2). The insertion resulted in the disruption of the DDX26B gene (550 bp downstream of DDX26B exon 8) and placed the 5' MLL region 3,951 bp upstream of the CT45A2 gene. As a result of the insertion, the CT45A1 gene was also deleted. The loss of 11q23 material led to an interstitial deletion on the der(11) chromosome. A more centromeric gene located at 11q23.3, FXYD2, was found to be localized upstream of MLL exons 10-37. However, the intact FXYD2 gene is oriented telomere to centromere, thus giving rise to a transcript into the opposing direction with regard to the orientation of the remaining 3'-MLL gene. Nevertheless, the 3'-MLL gene could possibly be transcribed from the recently identified gene internal promoter upstream of MLL exon 12 , resulting in 5'-truncated MLL protein fragment of about 230 kDa. However, transcripts starting directly at MLL intron11/exon12 borderline can hardly be distinguished from endogenous MLL transcripts deriving from the intact chromosome 11. Therefore, we investigated this not further. RT-PCR with an sense primer located on MLL exon 8 and an antisense primer located on CT45A2 exon 2 resulted in two PCR amplimers of 407 bp (weak) and 481 bp (strong), respectively (Figure 3A). Additional RT-PCR analysis with antisense primers located on CT45A2 exon 3 and a sense primer located on MLL exon 8 gave additional support to these results (data not shown). 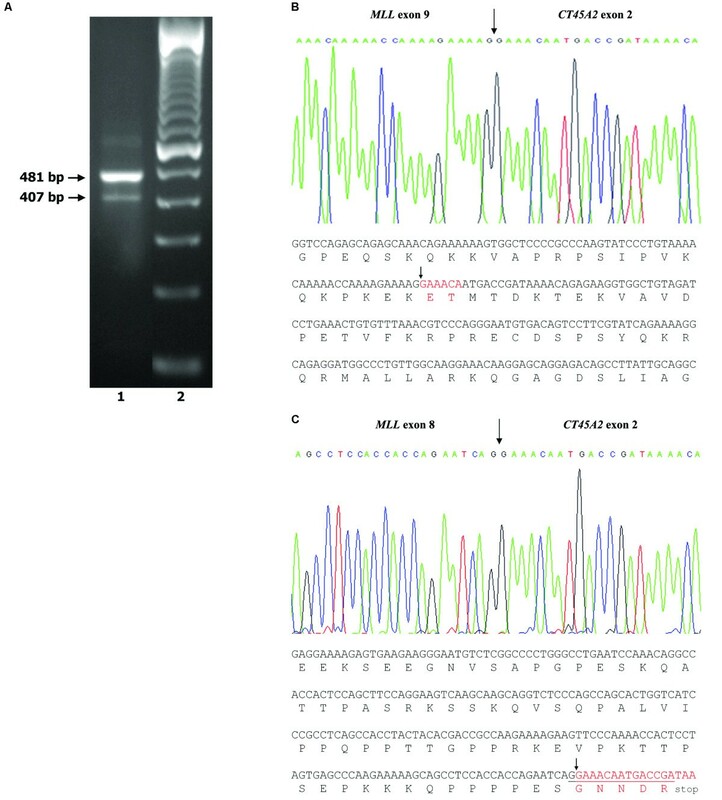 Sequencing of the 481 bp amplification product followed by a BLAST search confirmed that MLL exon 9 was fused in-frame with nucleotide 240 of the CT45A2 transcript (GenBank accession no. NM_152582; see Figure 3B). This fusion transcript contains 6 bp from the 5-UTR of CT45A2 exon 2 fortuitously coding for two additional amino acids (Figure 3, marked in red). The fainter 407 bp amplification product was also sequenced, and an out-of-frame splicing of MLL exon 8 to CT45A2 exon 2 was detected that leads to a premature stop codon 14 nucleotides downstream of the splice junction (Figure 3C). The in-frame fusion is predicted to give rise to a chimeric protein where the N-terminus of MLL is fused to the entire open reading frame of CT45A2. The putative MLL-CT45A2 fusion protein of 1,514 amino acids contains 1,325 amino acids from the N-terminal portion of MLL and 189 amino acids deriving from the CT45A2 protein. Detection and analysis of the MLL-CT45A2 fusion transcript. (A) RT-PCR analysis with a MLL sense primer located in MLL exon 8 and one CT45A2 sense primer located in CT45A2 exon 2 (lane 1). Lane 2 - 100 bp molecular marker. (B) Partial sequence of the junction of the MLL-CT45A2 e9e2 chimeric mRNA, showing the nucleotide sequence of the fusion transcript containing 6 bp (in red) from the 5' UTR of CT45A2 exon 2 coding for two additional amino acids. The arrow shows the in-frame fusion between MLL exon 9 and CT45A2 exon 2. (C) Partial sequence of the junction of the MLL-CT45A2 e8e2 chimeric mRNA, showing the nucleotide sequence of the fusion transcript. The arrow shows the out-of-frame fusion between MLL exon 8 and CT45A2 exon 2 that leads to a premature stop codon 14 nucleotides downstream of fusion breakpoint. We searched all the breakpoint regions (2000 bp each side) for interspersed repeats and low complexity DNA sequences. All breakpoint regions were found to be rich in long repetitive sequences (Figure 4): MLL intron 9 (four SINE/Alu sequences), DDX26B intron 8 (three SINE/Alu sequences, two LINE/L1 sequences, two LINE/L2 sequences, and one SINE/MIR sequence), the 5'CT45A2 breakpoint region (three SINE/Alu sequences, one LINE/L1 sequence, four LTR/ERVL sequences, two LTR/MaLR sequences, and one low complexity repeat), and the 3'FXYD2 breakpoint region (two SINE/Alu sequences, two SINE/MIR sequences, and one low complexity repeat). Homology search showed that two of the Xq26.3 SINE/Alu sequences located 3' of the DDX26B breakpoint (2189-2492 bp) and 5' of the CT45A2 breakpoint (155-391 bp) where highly homologous (77%) (Figure 4). Moreover, we searched the vicinity of the breakpoint junctions (25 bp each side) for short repetitive sequences and found an inverted repeat (TTCACTT-AAGTGAAA) flanking the 5'CT45A2 breakpoint junction (-9 to -3 bp and +1 to +7 bp). However, all analyzed chromosomal breakpoints were always located outside of these repetitive DNA sequences, indicating that they are possibly not involved in the recombination event. Schematic representation of the 11q23.3 and Xq26.3 breakpoint regions. The localization of the long repetitive sequences including the two highly homologous Alu sequences located in the vicinity of the Xq26.3 breakpoint is depicted. L1 (LINE/L1), L2 (LINE/L2), Alu (SINE/Alu), LCR (Low Complexity Repeat), MIR (SINE/MIR), ERVL (LTR/ERVL), MaLR (LTR/MaLR). None of the breakpoints were located inside these repetitive elements. We have identified a novel fusion partner of MLL, the CT45A2 gene, which is a member of the Cancer/Testis (CT) gene family cluster localized at Xq26.3. In our pediatric patient with de novo biphenotypic acute leukemia, the MLL-CT45A2 fusion resulted from a cryptic insertion of 11q23 material into Xq26.3. The insertion of the 5'MLL region upstream of the CT45A2 gene leads to MLL-CT45A2 fusion transcripts. In our case, a weaker transcript exhibited MLL exons 1-8 fused to CT45A2 exon 2 and consecutive exons. This transcript is out-of-frame and produces only a truncated version of the MLL protein. The stronger PCR product, however, represented an in-frame fusion transcript containing MLL exons 1-9 fused to the intact CT45A2 transcript, a process known as spliced MLL fusion since the chimeric MLL-CT45A2 is only generated at the RNA level . Interestingly, the chimeric mRNA contains 6 bp from the 5-UTR of CT45A2 exon 2 resulting in two additional amino acids. To our knowledge, this is the first description of a spliced MLL fusion resulting from an insertion event. Indeed, spliced MLL fusions were previously described in leukemia patients with the translocations t(1;11) (MLL-EPS15), t(4;11) (MLL-AFF1), t(9;11) (MLL-MLLT3), t(11;15) (MLL-MPFYVE), t(11;19) (MLL-MLLT1) and t(11;22) (MLL-SEPT5) [6, 8, 19], as well as in a single leukemia patient with an intrachromosomal 11q23 deletion (MLL-DCPS) . Spliced MLL fusions can occur either by transcriptional read-through followed by a subsequent splice event or by trans-splicing . Regardless of the underlying mechanism, the chimeric MLL-CT45A2 fusion is only produced at the RNA level. A reciprocal CT45A2-MLL transcript does not exist because the FXYD2 gene, transcribing in the opposite direction, is located upstream of the remaining MLL exons 10-37. However, we cannot exclude that the recently described gene-internal promoter upstream of MLL exon 12 is able to produce a 5'-truncated MLL protein of about 230 kDa . Another consequence of this spliced fusion is that the expression of the CT45A2 gene, usually restricted to testicular tissue , is activated. CT genes encode a heterogeneous group of immunogenic proteins (CT antigens) that were initially identified as immunogenic tumor antigens and whose expression is almost restricted to the normal testis and a percentage of various tumor types, including melanoma and carcinomas of the bladder, lung and liver [20–24]. The combination of restricted normal tissue expression, spontaneous immunogenicity and frequent tumor expression has made these antigens attractive targets for cancer vaccines [21, 24]. The CT45 gene family comprises six members (CT45A1 to CT45A6) located in Xq26.3 that are near-identical gene copies, suggesting the occurrence of recent gene duplications, but whose function remains to be elucidated . The phenotypic consequences of CT45A2 expression in the leukemia cells of this patient are currently unknown. However, as CT45A2 exhibits the typical CT antigen immunogenic profile, it would be worthy to further investigate the possible humoral and cell-mediated immune responses to this protein. Detailed analysis of the genomic breakpoint junctions in our patient revealed the presence of filler-DNA nucleotides and an inverted repeat flanking the breakpoint junction 5' of CT45A2. The repair of chromosomal double-strand breaks (DSBs) occurs by two types of DNA repair pathways: homologous recombination and non-homologous end-joining (NEHJ) [25, 26]. The presence of filler-DNA at breakpoints junctions are typical hallmarks of NHEJ , and inverted repeats may facilitate the formation of secondary structure intermediates between DNA ends at translocation breakpoints . Moreover, all breakpoint regions were found to be rich in repetitive sequences, particularly LINE/L1 elements and SINE/Alu repeats. Although repetitive sequences may occur near or spanning breakpoint junctions by chance, it is plausible that introns or genomic regions with a high density of repetitive sequences, such as MLL intron 9, are more vulnerable to breaking and non-homologous pairing that can lead to gene fusions. However, since the chromosomal breakpoints in our patient were always located outside of these repetitive DNA sequences, it is unlikely that they could be directly involved in the recombination events. The insertion of 11q23 in Xq26.3 was associated with the deletion of the 3' region of DDX26B (encompassing exons 9-16), leading to a premature termination of ddx26b open-reading frame (ORF). The DDX26B [DEAD/H (Asp-Glu-Ala-Asp/His) box polypeptide 26B] protein is a helicase that belongs to the DEAD/DEAH box family of proteins that are considered to be RNA helicases, which have been described to be necessary for, or involved in, many different processes of RNA metabolism . In eukaryotic cells, in particular, these range from transcription to degradation of RNA, and include pre-mRNA splicing, mRNA export, ribosome biogenesis, translation, initiation, and gene expression in organelles . Since our patient is a male, the only functional copy of DDX26B is disrupted as a result of the insertion, leading to the absence of the DDX26B protein in the cell or, in alternative, the presence of a truncated protein. Since the particular function of DDX26B in myeloid cells is not known, the phenotypic impact of this abnormality cannot be predicted. The insertion was also associated with loss of the only copy of the CT45A1 gene present in the cell. However, since CT45A1 expression is restricted to normal testis, the cellular impact of its loss is not expected to be relevant. Similarly, the phenotypic impact, if any, of the insertion in Xq26.3 of 16 additional 11q23 genes (FXYD6, TMPRSS13, IL10RA, APOO2962.2, TMPRSS4, SCN4B, SCN2B, AMICA1, MPZL3, MPZL2, CD3E, CD3D, CD3G, UBE4A, ATP5L, and AP001267.2) can also not be predicted. Nuno Cerveira, Claus Meyer contributed equally to this work. This work was supported by grants from the "Associação Portuguesa Contra a Leucemia" (2006-30.2.AP/MJ), the "Comissão de Fomento da Investigação em Cuidados de Saúde" (P.I. 26/2007), and by grant 107819 from the Deutsche Krebshilfe to R.M. This study was approved by the Institutional Review Board. NC designed and performed the research, analyzed the data and drafted the manuscript. CM designed and performed the research, analyzed the data and drafted the manuscript. JS performed the research and analyzed the data. LT, SL, and CC performed the chromosome banding and molecular cytogenetic studies. MP performed sequencing analysis. SB performed RT-PCR analysis. LN clinically assessed the patient. RM and MRT coordinated the study and participated in manuscript writing. All authors read and approved the final manuscript.